Runner-up Earl Pearson Jr. (left) congratulates winner Tyler Erb. What won the race: Tyler Erb's red-hot Georgia-Florida Speedweeks continued Tuesday at East Bay Raceway Park with his third victory in fourth Lucas Oil Late Model Dirt Series events. Erb stayed perfect in two 43rd annual Wrisco Winternationals events with a $5,000 victory in the 30-lapper. Key notes: One of the longest-running Georgia-Florida Speedweeks tracks, East Bay hosts six straight nights of Lucas Oil Late Model Dirt Series action for the 43rd annual Wrisco Industries Winternationals. ... Hall of Famer Billy Moyer is the all-time winningest East Bay Speedweeks driver; he's driving a Tye Twarog-owned car in his first East Bay appearance since 2015. ... The third-mile oval's surface famously changes throughout the night with tides from the nearby Gulf of Mexico thought to affect conditions. On the move: Brian Shirley of Chatham, Ill., started 11th and finished sixth. GIBSONTON, Fla. — Tyler Erb’s impressive Georgia-Florida Speedweeks continued Tuesday on the second night of the 43rd annual Wrisco Winternationals at East Bay Raceway Park. The 22-year-old New Waverly, Texas, driver dominated all 30 laps from outside the front row, adding another $5,000 to the $5,000 he captured in Monday’s 30-lap opener and giving him his third victory in four Lucas Oil Late Model Dirt Series events this season. Erb started his season on the national tour with a $12,000 victory Saturday afternoon at Golden Isles Speedway near Brunswick, Ga., as the new driver for Ohio-based Best Performance Motorsports. “I feel like we’re all winning this as a team. Everyone’s a part of this. They’re really excited. I’m not just the only one,” Erb said in victory lane after thanking his crew and supporters. “It’s been a dream come true, like I said yesterday. I’m probably one of the happiest people in the world. I’m lucky enough to be able to do this for a living and meet up with people like this. Polesitter Earl Pearson Jr. of Jacksonville, Fla., slipped back to fourth mid-race but rallied back to second, cutting Erb’s healthy lead in half in the final laps but still finishing 1.793 seconds behind at the checkers. Dennis Erb Jr. of Carpentersville, Ill. (no relation to the winner) was third while Brandon Sheppard of New Berlin, Ill., and Jimmy Owens of Newport, Tenn., rounded out the top five finishers in a race where Erb was comfortably ahead of a lively battle for second with Pearson, Dennis Erb Jr. and ninth-starting Kyle Bronson of Brandon, Fla., taking turns holding the spot. With his victory, Tyler Erb became the fourth driver to win the first two Winternationals features since the miniseries expanded to six races in 2000, and he’ll try to become the first driver to win the first three on Wednesday. He built a lead of nearly four seconds with 10 laps remaining, but Pearson regained second from Bronson on the same lap and began cutting into Erb’s margin. It was down to 1.7 seconds with six laps remaining while the leader considered whether to move to the high side to go around the slower car of Shanon Buckingham. “I really, I wanted to go high down there in (turns) three and four,” Erb said. “I was just waiting and (Edwards signaled) I had a little lead and they run up on me a little bit at the end, I think. Pearson, who ran second the first eight laps before losing the spot to Dennis Erb Jr., finished as the runner-up to Tyler Erb for the second time this season. Third-finishing Dennis Erb Jr. has six career victories but none since the 2015 opener. Two cautions slowed the feature The first start was called back by series officials and the only other caution appeared on the ninth lap when Stormy Scott slowed in turn two. Notes: Drivers who previously won the first two Winternationals since 2000 were Josh Richards, Jimmy Mars and Don O’Neal, who did it three times, most recently in ’12. … Nineteen of 26 starters were on the lead lap and 21 were running at the finish. ... The checkered flag fell at 8:59 p.m., five minutes earlier than opening night. Starting from the outside pole in the 30-lap feature, Tyler Erb will bid to become just the fourth driver to win East Bay’s first two Winternationals features since the miniseries was expanded to six nights in 2000. He would join Don O’Neal (2001, ’02, ’12), Jimmy Mars (’04) and Josh Richards (’16). … Polesitter Earl Pearson Jr. owns three career Winternationals triumphs but hasn’t won since 2013. … After Texan Morgan Bagley received a needed morale boost with his victory in the final heat race, he climbed out of his car, walked to his pit-area neighbor Gregg Satterlee’s car and told Satterlee’s crew chief Robby Allen that the slick third-mile oval was a “little treacherous.” Allen, who has seen many Winternationals at the tricky East Bay layout, quickly replied: “This place is never not treacherous.” … Bagley’s win, which earned him the sixth starting spot in the feature, noted that he’s hopeful of running an incident-free 30-lap to feel out his new Black Diamond Chassis. In his previous Speedweeks feature start, on Saturday at Golden Isles Speedway, his car’s left-front suspension was damaged in a tangle just two laps into the race. … Billy Moyer Jr., who chased Bagley under the checkered flag in the sixth heat, transferred through a prelim for the first time in four Speedweeks starts. … Heat 3 winner Shanon Buckingham cracked an East Bay Winternationals feature lineup for the first time in his career. … Scott Bloomquist scratched from the first consolation race because of damage his car sustained in a heat-race scrape. His machine sported a good amount of crunched sheet metal, mostly to its right side door and left-front nosepiece; he can start the feature thanks to a Lucas Oil provisional, however. Row 6: Brian Shirley, Billy Moyer Jr.
Row 9: Jonathan Davenport, Billy Moyer Sr. 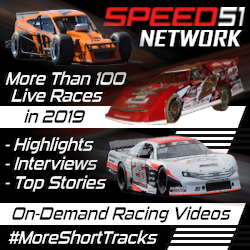 Finish (winner transfers): Austin Hubbard, Blake Spencer, Justin Williams, Vic Hill, Austin Rettig, Jason Jameson, Dan Stone, Greg Oakes, Blair Nothdurft, Rusty Schlenk, Joel Callahan, Michael Lake, Colton Horner, Chuck Hummer, John Tweed, Freddie Carpenter, Mike Benedum, Allen Murray. First consolation (top two transfer): Stormy Scott, Brandon Overton, Justin Williams, Austin Rettig, Chase Junghans, Colton Horner, Jeff Mathews, Jason Jameson, Freddie Carpenter, Blair Nothdurft, Michael Lake, Tyler Carpenter, John Tweed, Terry Casey, Joel Callahan, Bob Geiger. Scratched: Scott Bloomquist, Zack Dohm, Devin Gilpin. Second consolation (top two transfer): Don O'Neal, Devin Moran, Austin Hubbard, Blake Spencer, Greg Oakes, Mike Benedum, Dan Stone, Allen Murray, Devin Dixon, Ryan King, Vic Hill, Rusty Schlenk, Jonathan Rowan, Kerry King, Matt Cosner, Chuck Hummer, Tim Dohm, Joey Moriarty, Joe Denby. Morgan Bagley won an early side-by-side duel with polesitter Billy Moyer Jr. to grab a victory in the sixth heat. Moyer Jr. fought off his Hall of Fame father, who finished third ahead of Devin Moran in the caution-free prelim. Finish (top three transfer): Morgan Bagley, Billy Moyer Jr., Billy Moyer, Devin Moran, Allen Murray, Tim Dohm, Vic Hill, Joey Moriarty, Kerry King. Jimmy Owens got the jump on fellow front-row starter Tanner English and raced to a victory with English holding second all the way. Hudson O'Neal came alive at halfway, going from sixth to third in two laps while taking the final transfer spot from Matt Cosner. Blake Spencer held the third spot at halfway before he got sideways exciting turn four and fell from transfer contention. The first start was called back. Finish (top three transfer): Jimmy Owens, Tanner English, Hudson O'Neal, Blake Spencer, Austin Hubbard, Matt Cosner, Dan Stone, Jonathan Rowan, Rusty Schlenk. Red-hot Tyler Erb won the fourth prelim from the pole, edging away from fellow front-row starter Colton Flinner for the victory. Flinner rought off fellow Pennsylvanian Gregg Satterlee with both transferring ahead of Don O'Neal in the caution-free prelim. Finish (top three transfer): Tyler Erb, Colton Flinner, Gregg Satterlee, Don O'Neal, Mike Benedum, Greg Oakes, Ryan King, Devin Dixon, Joe Denby, Chuck Hummer. Shanon Buckingham won from outside the front row to make the feature after missing in all six attempts last season. Polesitter Brian Shirley finished second, holding off the eighth-starting Jonathan Davenport. John Tween spun in turn two on the final lap. Three starts were required to get the race going; the first start was called back, and Terry Casey spun on the backstretch of the second start when he was squeezed by Jonathan Davenport. Finish (top three transfer): Shanon Buckingham, Brian Shirley, Jonathan Davenport, Terry Casey, Chase Junghans, Colton Horner, Freddie Carpenter, Michael Lake, John Tweed. Polesitter Brandon Sheppard pulled away from a four-wide battle for second on the first lap and cruised to victory. Kyle Bronson fell back early after starting outside the front row but rallied late to get second ahead of fifth-starting Tim McCreadie. Justin Williams emerged from the early four-wide battle to grab second, but he fell back on a late restart and settled for fourth. Devin Gilpin spun exiting turn four while running fifth on the seventh lap. Finish (top three transfer): Brandon Sheppard, Kyle Bronson, Tim McCreadie, Justin Williams, Tyler Carpenter, Austin Rettig, Jeff Mathews, Blair Nothdurft, Devin Gilpin. Outside front-row starter Earl Pearson Jr. got a good start and rolled to victory in the 10-lap prelim. Dennis Erb Jr.'s start wasn't as good, but the third-starting Erb rallied to second by halfway and secured the runner-up spot over Josh Richards, the final transferree. Polesitter Stormy Scott's poor start left him with a fourth-place finish. The first start was called back after Zack Dohm, Scott Bloomquist and Jason Jameson tangled in turns one and two; the prelim was restarted. Finish (top three transfer): Earl Pearson Jr., Dennis Erb Jr., Josh Richards, Stormy Scott, Brandon Overton, Jason Jameson, Scott Bloomquist, Joel Callahan, Zack Dohm, Bob Geiger. Row 1: Stormy Scott, Earl Pearson Jr.
Monday’s winner Tyler Erb of New Waverly, Texas, topped 56 qualifiers Tuesday in the second round of East Bay Raceway Park’s 43rd annual Wrisco Winternationals. Erb tripped the clock at 14.479 seconds in the Lucas Oil Late Model Dirt Series event and he’ll start on the pole of the fourth of six heats. Other heat race polesitters: Stormy Scott of Las Cruces, N.M.; Brandon Sheppard of New Berlin, Ill.; Brian Shirley of Chatham, Ill.; Jimmy Owens of Newport, Tenn.; and Billy Moyer Jr. of Batesville, Ark. Under absolutely perfect weather conditions — sunny skies with temperatures topping out in the low 70s — a 56-car field is signed in for Round 2 of the Wrisco Industries Winternationals. The total is a three-car increase from the opener’s turnout and represents the largest car count for a Winternationals event since 2011. … New additions to the action Austin Rettig of Sikeston, Mo., and Greg Oakes of Franklinville, N.Y. — two drivers who were on the grounds Monday but didn’t race — and teenager Michael Lake of Uniontown, Pa., whose hauler pulled into the pit area late Monday. … With the Monday’s victory by Tyler Erb of New Waverly, Texas, three of the last four Winternationals features dating back to last year have been captured by drivers scoring first-ever wins in the miniseries. Brandon Overton of Evans, Ga., and Kyle Bronson of Brandon, Fla., joined the Winternationals winner’s list with triumphs in two of last year’s last three races. … After Rocket Chassis house car owner Mark Richards saw his three-year Winternationals opener win streak end Monday with a third-place finish by Brandon Sheppard of New Berlin, Ill., he wondered if he perhaps he should have brought along his battle-tested XR1 car that has sat in victory lane following East Bay’s lidlifters in 2016 (with Josh Richards of Shinnston, W.Va.) and ’17 and ’18 (Sheppard). He said the machine that has about 175 starts on its resume is sitting in Rocket’s Shinnston, W.Va., shop and “looks brand new,” but he opted against running it in this year’s Speedweeks activities. … Tim Dohm of Cross Lanes, W.Va., is ready for action after replacing the broken engine rocker arm that sidelined him during Monday’s heat racing. Engine builder Vic Hill visited Dohm’s pit stall on Tuesday to install the new rocker, which Dohm borrowed from the Rattliff Racing team and driver Jason Jameson of Lawrenceburg, Ind., Dohm’s pit-area neighbor. Jameson’s crew chief, Jeff Gullett, joked that the motor component wasn’t the only assistance his camp has provided to Dohm already this week. “We’ve rebuilt their cars for them,” Gullett quipped, to which Dohm agreed that he and his son, Zack, had some prep left on their machines upon arrival at East Bay. … Justin Labonte of Longhorn Chassis is celebrating his 38th birthday while in the pit area helping house car driver Tim McCreadie of Watertown, N.Y. … Former Lucas Oil Series director Ritchie Lewis is on the radio tonight serving as race director. He’s brushing up on his race-directing skills so he’ll be ready later this year when he will spend the race weekend at Magnolia Motor Speedway in Columbus, Miss., filling in for current series director Rick Schwallie. Action is set to resume Tuesday evening with the second round of the 43rd annual Wrisco Winternationals with red-hot Tyler Erb of New Waverly, Texas, trying to continue his hot streak at Georgia-Florida Speedweeks. Erb, Monday’s opening night winner and a winner of two of three Lucas Oil Late Model Dirt Series at Speedweeks, will be among the favorites at the slick third-mile oval along with other Monday contenders Josh Richards of Shinnston, W.Va., Brandon Sheppard of New Berlin, Ill., and Billy Moyer of Batesville, Ark., the winningest Speedweeks driver who is piloting a Tye Twarog-owned Rocket at East Bay. The expected field of about 55 entries will be split in half for time trials followed by six heat races, two consolation races, the Berry Barn Strawberry Dash presented by DirtonDirt.com and the 30-lap main event. Row 6: Shirley, Moyer Jr.
Row 9: Davenport, Moyer Sr.